I think I should add a new category to my recipes: PLEASE MAKE ME! This one would go right in, without a shadow of a doubt. Of course, if you are part of the team that hates white chocolate and rather goes for statements like “it’s not real chocolate“, and “any chocolate connoisseur should walk away from such abnormality“… then, maybe these cookies are not for you. I am not 100% sure, though. Something about the marriage between white chocolate and macadamia nuts might shake the convictions of even the most stubborn anti-white chocolate being. Please make these. As Mel described them in her post: these are absolute perfection. In a large bowl, beat together the butter, granulated sugar and brown sugar in the bowl of a stand mixer until the mixture is well-combined. Add the vanilla and eggs and beat until the mixture is creamy and light in color, 2-3 minutes. Stir in the flour, salt and soda and mix until just combined; a few streaks of flour remaining are not a problem. 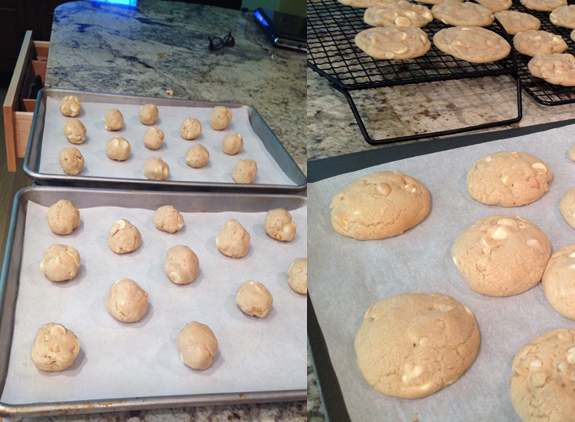 Add the white chocolate chips and macadamia nuts and mix until combined and no streaks of flour remain. Roll tablespoon (or slightly larger) size balls of dough and place on silpat or parchment lined baking sheets, 1 to 2 inches apart. Growing up, I did not like nuts. In those days, back in Brazil, they were awfully expensive, something reserved for special occasions, which in our family meant…. December, with Christmas and New Year’s Eve on the horizon. My Dad would buy walnuts and pecans, still in their shells, and every evening after dinner, would sit at the sofa, patiently cracking them, one at a time. He loved to show off and crack them karate style, much to my Mom’s despair, as pieces of shell would fly everywhere, and sometimes his hand would be hurt in the process. He never admitted to being hurt, instead acted as if he felt no pain whatsoever. If a nut resisted his blows, he would walk to the door that separated the living room from my bedroom, wedge the nut between the frame and the door, and crack it by attempting to shut the door close. Mom would not approve of that either, as it makes a royal mess on the floor. As you can see, anything but a real nut cracker was part of the game. Not that we did not have one, I vividly remember a beautiful silver gadget sitting over the table, neglected to a minor decorative role. Go figure. Dad probably thought that nut crackers were for sissies. After all that hard work, he would dig chunky pieces of walnuts from the shell, and offer me. Silly child that I was, I promptly twisted my nose. But now that I am older and wiser, I find myself in love with every single type of nut, oddly enough maybe the Brazil nut is the one I like the least. But macadamia, pistachios, walnuts, almonds, pecans, hazelnuts… love them all! Roasted, salted, raw, in sweets, in sauces, in pestos… Dad would be proud. « OH, MY GOD! I THINK I SAW SOMETHING…. With the white chocolate and macadamia nuts, I bet they’re very tasty indeed. These look great. Do they deflate as the cool? Those would go fast in our house. I’m a fan of all types of nuts too and love them in cookies. 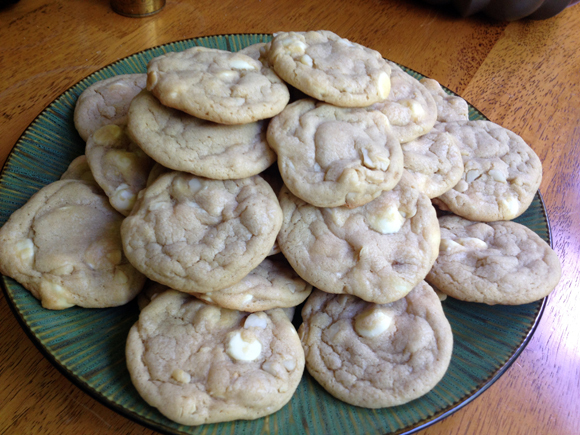 Would try this version of white chocolate and macadamia cookies for sure because I prefer white chocolate to ‘regular’ chocolate. There I said it!! Macadamia nut is near and dear to my heart (my dad’s fave) and these cookies sound positively dreamy. They remind me of a place I used to work at in Montreal called “Monsieur Félix & Mr. Norton” — the cookies were soft, moist and delicately chewy. A dream really. The kind of indulgence I could permit myself frequently at the age of 19!! (haha 😉 ). I never liked bittersweet chocolate, but Phil patiently worked on that magic, and now I like it. But my favorite is by far white chocolate, love the stuff! 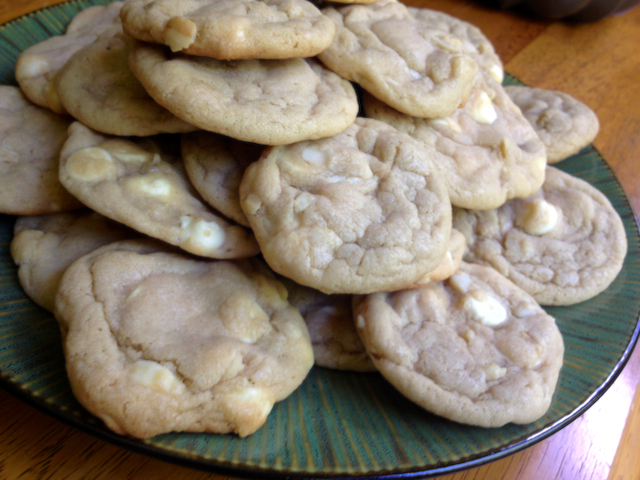 White chocolate mac nut cookies have been my favorite cookie since I was young! Must try your version of these!! I hope you do try it, these were fantastic! If I had to pick a favorite cookie…this would be it Sally! Thank you so much for sharing them! Oh my goodness, I think I could eat a truckload of these, Sally! Yummo. Who cares if white chocolate isn’t “real” chocolate, it still tastes awesome, especially when paired with rich macadamias. Yee Ha!